Complete shower enclosure packages - easiest & fastest DIY installation! The Ultimate Outdoor Shower Enclosures. 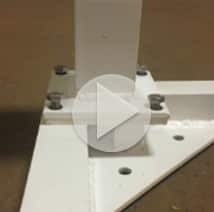 Crafted from 100% Pure Virgin PVC vinyl, the industry’s maximum thickness, combined with welded frames and reinforced supports, this structure provides superior construction to last a lifetime and will always look new. 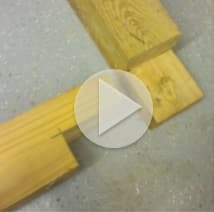 Concrete pad not required – eliminate hassle and cure time by using pressure treated wood or securing to decking. After a swim at the beach or in the pool, conveniently rinse off in your own beautiful secure and private outdoor shower. No more dripping bathing suits and sand tracked throughout your home. Available in two different models and two different sizes. 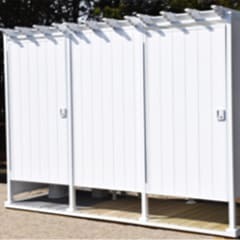 Our outdoor shower double units provide you with the convenience of a changing room that can be separated with or without a secure partition half wall to keep clothes dry and your family and guests can change in complete privacy. Available in eight different models and two different sizes. The cabana models are ideal for homeowners who want the convenience of outdoor living by adding a bathroom to our double unit. Extend the walls for privacy and add a SaniFlo toilet and sink. Why would you ever need to go into your home again? 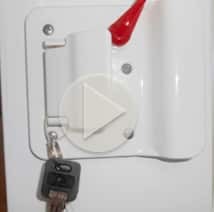 Keep family and guests outside while keeping your home clean on the inside. Available in two different models and two different sizes. I visited the showroom of Outdoor Showers. Todd gave me a thorough explanation of his product. I then went to compare similar products or build it myself or by a contractor. Three weeks later I purchased my Serenity Enclosures. Best product for the money and great service!! From beginning to the very end – your commitment to us and the project was outstanding. You were devoted to us 100%! Great Outdoor Shower! Everyone loves it. The shower is great! Beautiful! Great customer service and a creative, unique product. This shower is perfect for getting the sand off before heading inside, off the dog too! The last one we built from scratch out of treated lumber… I’d rather just buy it now!! Love our shower!!! Many thanks! 732.597.2699 — Call now— We ship anywhere in the US! 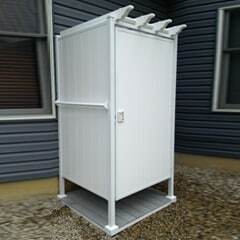 Tags:" todpod showers, pvc shower enclosure, todd pod,toddpod showers, serenity enclosures, complete outdoor shower, quick install outdoor shower enclosures, quick install outdoor showers, outdoor shower enclosure, pre-fab outdoor shower enclosure, outdoor cabana showers, complete shower enclosure package, vinyl shower enclosure, outdoor shower for cabana, custom outdoor shower, toddpodd, fast installation outdoor shower system, custom modular cabanas, modular shower enclosure, modular cabanas, outdoor cabanas, outdoor lockers, pre-fab cabanas, high end outdoor shower, nice outdoor shower, pvc ourdoor shower, fast installation showers, outdoor shower, outdoor changing rooms "